Just outside the busy city limits of San Diego, lies the sleepy Mountain Empire area known as Jacumba, which is home of the Desert View Tower. The Desert View Tower was built from 1922 to 1928 near Jacumba, California as a roadside attraction by Bert Vaughn, a real estate developer who owned Jacumba during that time. The Desert View tower, a three story stone tower, houses a museum and has an observation deck on its upper level. Animal sculptures called the Boulder Park are located next to the tower, and were sculpted by M.T. Ratliffe over two years during the 1930′s in the local stone. The tower and sculpture garden were listed on the National Register of Historic places on August 29, 1980. What many visitors to the Desert Tower may not know is that the structure has been investigated for paranormal activities, and according to one paranormal group may very well be haunted. The ECPI team did several other local paranormal investigations until ceasing operations. Esteban Martinez and Jared Knight have now taken over as team leaders and are contemplating ECPI’s future. In a recent correspondence with SDH in November 2012, Esteban Martinez made clear he believes the Desert Tower is not only haunted but possibly by an intelligent source. The extent or reason behind this possible haunting is yet another mystery for the local paranormal community to contemplate. 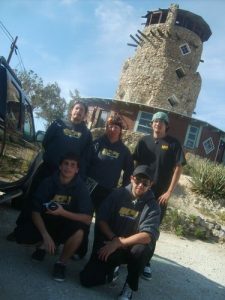 One Response to "Ghost hunting at the Desert View Tower in Jacumba"